When Catholics think of the Church and science, they often squirm with thoughts of Galileo; rarely to they contemplate the rich legacy of Catholic scientists in the past or the acclaimed research of the Vatican Observatory in the present. 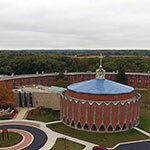 Through the Science for Seminaries Grant, Sacred Heart Seminary and School of Theology (near Milwaukee, Wisconsin) is training future priests to move beyond apologetics and embrace science as one part of Catholicism’s vibrant intellectual tradition. For the integration of science into our core curriculum, we’ve adopted a two-track course of action. The first track, designated “Creation and the Heart of the Universe,” focuses on astronomy, astrophysics, and evolution. This track engages courses in fundamental theology, church history, cosmology, and Trinitarian theology. The second track, “Love and the Heart of the Mind,” highlights the relationship between neuroscience and psychology in theological discussions on the nature of love. This track engages courses in theological anthropology, eschatology, moral theology, and bioethics. In this way, we explore both the vertical relationship between people and the cosmos and, at the same time, the horizontal relationships among people through both rationality and emotion. As a kick-off event, we hosted a “Gold Vespers” on November 15, 2018 (embracing the new tradition of “Gold Masses” for Catholic scientists). This event included a stimulating lecture by Fr. James Kurzynski, a parish priest of the Diocese of La Crosse who has worked with the Vatican Observatory in the public outreach, both through his blog and his recent book, God’s Canvas: An Exploration of Faith and Science (2016). In March 2019, we will take three faculty and fifteen seminarians to Tucson, Arizona, to learn the latest in astronomy from Br. Guy Consolmagno, S.J., the Director of the Vatican Observatory. Later in the spring and early fall, we plan to host various events that highlight the accomplishments of Catholic scientists, especially American priest-scientists.